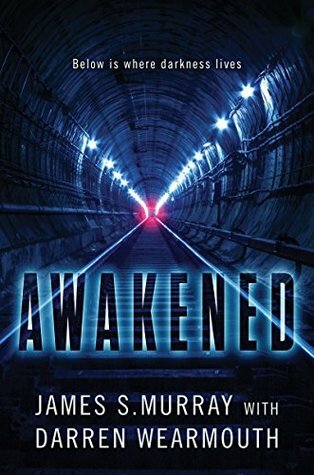 Written by James S. Murray of Impractical Jokers fame with sci-fi author Darren Wearmouth, Awakened really couldn’t have come at a better time. Summer is here, and this impossibly fun and deliciously creepy horror-thriller would make for the perfect read by the beach, pool, or anywhere really—as long as it’s bright, sunny, above ground, and surrounded by people. Trust me on this, if you want to avoid nightmares. Set in New York City, the story begins in a mood of celebration as the city’s long awaited new subway line is about to be officially opened. After years of construction, the state-of-the-art expression train complete with a visitor’s pavilion and underwater viewing area beneath the Hudson River is finally ready to take on its first passengers. Many important guests have gathered to witness and commemorate the inaugural run, including NYC’s mayor and even the President of the United States. Dozens of journalists from across the globe are also on site, ready to capture the historic moment when commuters disembark from that first train. But deep below the city, something else is stirring. Ancient and monstrous, they have been there all along, but the recent drilling of the tunnels has disturbed the bedrock in which they make their home, and they’re about to make their displeasure known. As the first train pulls into the station, no smiling passengers greet the cameras. Instead, the cars are empty, save for all the blood and viscera splattered everywhere. But by then, it’s too late for everyone else to escape. Pockets of methane gas released from beneath the earth fills the tunnels. A breach causes water levels to rise. And in the darkness, nightmarish horrors are waiting. If you’re claustrophobic, don’t read this book. Awakened gave me serious flashbacks to the Alien movies, especially the scenes where our characters find themselves in dingy, tight, dark spaces, with all that was missing being a hair-raising motion tracker sound effect. But if, on the other hand, you happen to be into books that read like a campy disaster thriller meets sci-fi horror, then this might just be up your alley. It might also please you to know that the story throws readers into the action right away, and that there’s absolutely no skimping on the blood and gore or edge-of-your-seat suspense. When it comes to plot, I can’t say I typically expect much from books like these. To the authors’ credit though, they made a valiant attempt to thicken things up with a second act twist complete with a grand conspiracy theory about government secrets and supernatural phenomena. Totally ridiculous and over-the-top? Maybe. Yet the story was no less entertaining despite the insane shenanigans, and in the end, that’s what counts. In addition, the stage is set for a possible sequel, which would hopefully provide answers for the mysteries left unexplained here. While the summer may be heating up, you can still count on Awakened to give you a few shivers. If you’re looking for a good scare delivered in a fast-paced, blockbuster-style novel with thrilling action and horror, this novel should do the trick. Overall, I thought it was a fun and thrilling read, perfect for a bit of escapism. Audiobook Comments: I’m often wary of authors narrating their own books, but in James “Murr” Murray’s case, his theater and TV experience no doubt gave him the edge for voice-over performance and overall showmanship. Being the expert on his own story, he knew exactly how to deliver his characters’ conversations, which lines of dialogue to stress, and which parts of the story to emphasize. All in all, Awakened was a compelling listen. I have noticed that you regularly get your content linked by that *let’s leave words out of this at the moment because I have nothing good to call them” fantasyonline site. Is there anything that can be done from a user standpoint? Or is that just one of the banes of the freedom of the internet? They have started hitting my content up and it just annoys me beyond belief. Especially when I found there was no way to contact them to ask them to stop. As for this book, is there one main character or it is a group of POV’s? Yeah, sites like that just hit up one blog after another. Not much to do unfortunately, and as a rule I never reply/contact spammers as that can only makes it worse, so I just delete and mark as spam if I see them (or whenever I remember to go into my comments UI to do clean up – I hadn’t done that in a while, so thanks for reminding me). I assume that eventually WP’s algorithm will catch up and stop them for me. This one sounds good and the fact that it is a standalone – even better! This one is already earmarked for reading, and I’m happy to learn it’s a fun book. Nice one! I hope you’ll enjoy! I’m reading this right now and it’s a ton of fun. I thought the set up was lacking, we nearly jumped head first into the action with very little lead up, but so far it’s pretty much what I expected. Definitely fun, and true, the authors don’t mess around! They really throw you headfirst into the action, don’t they? Haha, probably a good idea! I would be VERY uncomfortable reading this one if I was claustrophobic, lol! Yup, I’m claustrophobic, so I’ll pass. 😛 But lol yeah, modern thrillers like these usually end up trying to justify or “science up” its over-the-top premise as government conspiracy, so I can totally imagine how this one went down. 😉 Excellent review! This is one that I’ve added to the wishlist – whether I’ll get a chance to pick it up remains to be seen – I’m a bit swamped already. Oh, I feel ya. I wish I had time to read everything I want! Well, intense shenanigans do sound good! I can’t really watch Alien type movies without serious risk of heart attack, but i think i could do them as books 😀 I mean, nothing’s gonna jump out of it, i hope!